For many years, I did not doodle in meeting. I did not doodle in classes. I did not doodle in my spare time. What I did, was grab a piece of paper (any size) draw some black lines on a page, and color every other section on the page until the page was full. During computer classes, I would open up Microsoft Paint and do the same thing. Some people may call it OP Art, Optical Art. I never got that detail. I never tried to create an optical illusion. It just was lines on a page. It was like a game. If helped me from falling asleep in meetings and classes. I could do this task and still pay attention to what was going on around me. In computer classes, the people sitting behind me would watch my monitor as I was creating a piece. Microsoft Paint was always installed on the computers, even if games or the internet was not. Draw black lines on a page. Circles, squares, squiggly lines, it did not matter. If you were brave, use multiple colors. Sections of the same color not could touch. I am going to try over the next few days to repeat this experiment. I am going to call it the Art of Concentration. Even though, this art work sound simple enough, it requires concentration. You have to figure out what section to color. If you lose concentration, you may color the wrong section. Today’s piece, I thought is was something simple. Wrong! Now to color every other section: Where did I go wrong? To figure it out, I created the line drawing in Corel Draw and created a bitmap. I opened the line drawing in Microsoft Paint and colored the page. Paint vs. paper – if you mess up in Paint, you can correct it. If you would like to try coloring the page, I have created a PDF. Click Here. You do not have to color the same section that I colored, just pick a section to start. You can also find it on my newly created Coloring Page. The next step for printing 3D objects was to fine some 3D design software that support .STL or .OBJ files. There are a lot of free software available for 3D design. However, I am very warily of “free” software since a lot of “free” software (especially game software) comes with viruses, Trojans, and other nasty things. I found four that was worth looking into deeper. Tinkercad (https://www.tinkercad.com/): It is owned by Autodesk. Autodesk has been around for a long time. Google Sketchup (http://www.sketchup.com/): Do I really want to install another Google product. However, looking at the site, there was not direct indication it was owned by Google. 3DSlash (https://www.3dslash.net/index.php): Looked interesting. Take an object and remove parts. Blender (https://www.blender.org/): Has promise. Is part of the Open Source community. Since I use CorelDraw, I decided to look at their recommendations. They recommended developing a 2D design in CorelDraw, transferring it to CAD software, like AutoCAD or Autodesk 123D, then fine tuning it with Corel Technical Suite. Corel Technical Suite is $999. I think not! I decided since I was a beginner, I would start and learn with Tinkercad. I went through several lessons in Tinkercad to learn the basics. It was very helpful, especially learning to adjust the workspace. Many years ago, a friend told me I needed to sign all my art works. Most of my cards, houses, paintings now contains this logo. That is want I created first. Yes, I did make it double sided. If I had though about it before, I would have mirror the image on the reverse side. In the last two posts, I talked about setting up the Silhouette Curio and installing the Silhouette Studio software. Click here to read those posts. This post covers the my first design. This is my first design attempt. Nothing fancy. To start a new design in Silhouette Studio double-click on the icon and click Design. The design window opens with a clean working area. I clicked the Text icon to begin to place text in the design area. On the right-side of the screen, a Text Style menu appeared. The menu let me define my text attributes before or after I put the text in the design area. Scrolling through the fonts, I noticed that it allows me to use any font that is saved on my computer. Yay! No, limits there. I noticed the little circle to the bottom right of my text. Looking through the manual, I discovered this allows you to fit the text to a path. I drew a couple of wavy lines on the screen using the curve tool. I doubled clicked on the first line of text, to select it, and dragged the text to the first wavy line and than I repeated the process with the second line of text. Easy enough, my text was now wavy. Selecting the text that was fit to path, I was no longer able to rotate it or change it size by dragging a corner. I was able to adjust the rotation by selecting it’s line. There was also a slide bar that allowed me to change the text position on the line. Just for fun I drew a few more balloons. Balloons usually have a shiny spot on them that is reflecting the light. 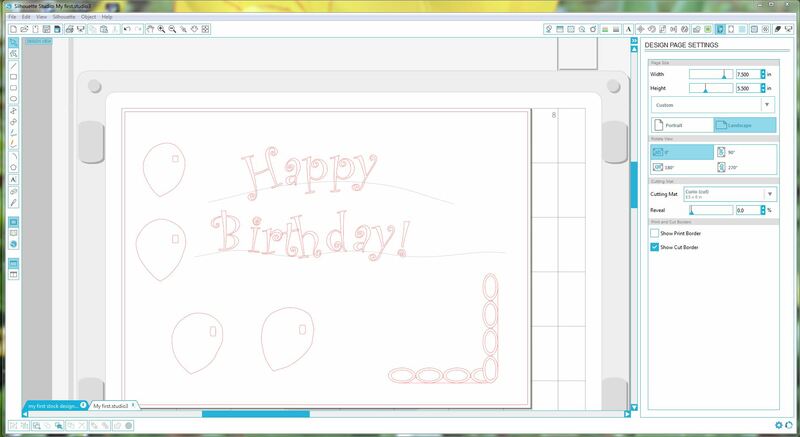 I use the rectangle tool to draw this area on a couple of balloons. It didn’t look quite right, so I selected the rounded rectangle tool to draw the shiny spot on the other balloons. If I move the balloons around the canvas, I wanted the balloon and shiny area to move together. I dragged my curser over both objects and selected the grouping icon to keep them together. To separate items after they are group, select the Ungroup icon next to the Group icon. A border for my birthday theme design would be nice. I drew a couple of rectangles and I drew numerous ovals . First I drew one oval, then I used the copy/paste feature so all the ovals would be the same size. I tried rotating a oval from the design area, but I found for a precise rotation the Rotate option for the Object menu worked better. I used the Align option under the Object menu to align, center, and space the ovals on around the rectangles. I didn’t like how some of the lines in the design. The Erase and Knife was a nice feature for removing unwanted lines. I was able to adjust the settings in the right menu as each tool was being used. A feature that the Silhouette Studio software is missing, is the ability for me to zoom in and out using the scroll button on my mouse. Zoom in and Zoom out is available from the top icon bar. The manual that came with the Curio did not cover all of these functions. But, the manual that is available from the Help Menu in the software does provide detail information about all tools, menus, and functions. I like to play around with any software before reading manuals. However, this manual is beneficial for using the software and Curio. The next blog will cover my experience with cutting and embossing. For now, I will save my work. This isn’t the first time I have saved my work. One of my saying is “Save Often! Save Regularly!” You can’t press save too often. The Silhouette Studio software comes with the Silhouette cutting machines (Cameo and Curio). Since I purchased the machine, the software installation was a simple process. Place the CD in drive and follow the prompts. 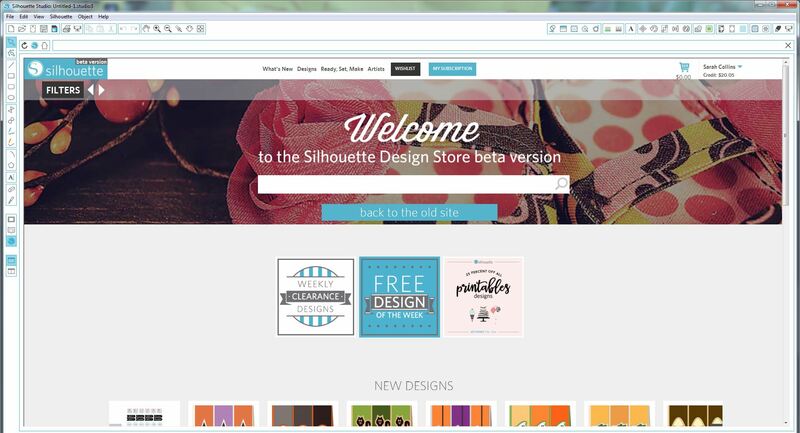 After the installation was complete, the Silhouette Studio software launched. I wasn’t expecting this screen. To be honest, I am not sure what I was expecting. I knew if I clicked Design it would let me design a graphic for cutting. Also, if I clicked Open it would prompt me to open a previous saved design. I assumed that if I clicked Library, I would see some graphics. That was the second surprise. There wasn’t any graphics in the Library. I thought that was odd, maybe it was something that you could download. I clicked on the Store. 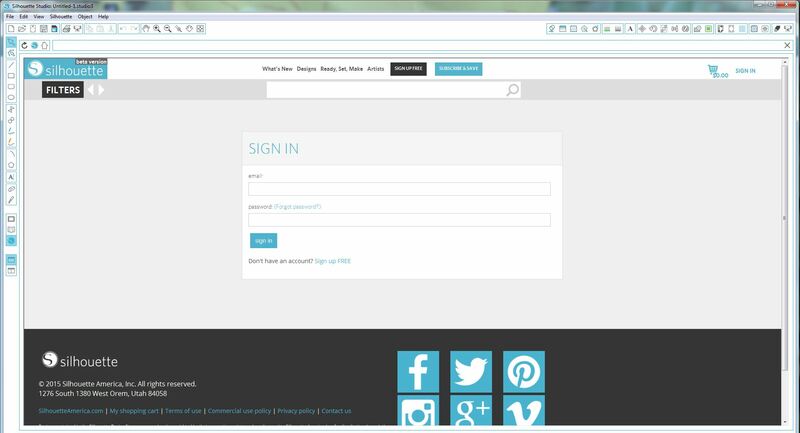 The Silhouette Design Store wanted me to sign in, or create an account. So, I signed in with the account I created when I registered the Curio. It appears that the store wants to charge you for everything. After looking over the store, I remembered the cards that came with the Curio title “1 month free.” I followed the instruction on the card and it provided a month subscription and $25 credit. I am not sure yet of the benefits of a subscription, but I will figure that out as I explore more. After looking over the store, the problem still remained. The Library was empty. Being the Techie I am, I decided maybe the software needed to be update. Off to http://www.silhouetteamerica.com I went. You don’t need to remember that URL or save it as a favorite. 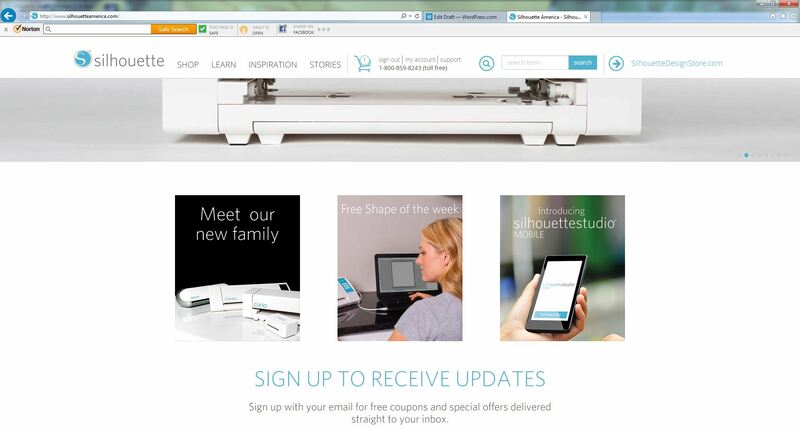 If you are into the Silhouette Studio software, it has the link listed under Help. It took me a while to find where the Software Update was located on the site. Sign into your account; it is the same one you created when you registered the machine. Click Support, it is listed next to the Sign in. 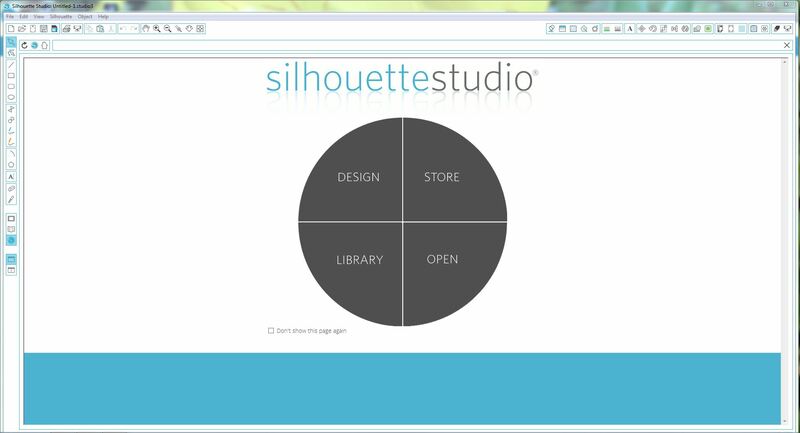 Click Silhouette Studio then scroll all the way to the bottom of the page. There you will find the update and download. Select one to download. You do not have to run both the update and the download, because they are the same file. After the software downloads, run it. After I went through all these steps below, I realized you can check for software updates from the Silhouette Studio software. Look under Help > Check for Updates. Back to the Silhouette Design Store to get some graphics with my credit. The store had some very impressive designs. I selected a few for testing but adding them to the shopping cart. When I went to check-out, it told me that these designs were for personal use only. What I liked about the entire store, since I have credit it did not ask for my credit card.